Laia is a young Saharaui woman who has lived in Spain for years; she has a promising future but must bear the burden of terrible memories: although neither her family nor her boyfriend Julio know this, Laia’s childhood was made miserable by torture and threats at the hands of her supposed family, among the haimas that make up the Dajla camp controlled by the Polisario Front. And now, many years later, this past has resurfaced to claim her. Her brother Ahmed’s arrival in Spain, determined to make her return to Africa, sets off a chain of events that will turn her relationship upside down. Julio’s father, Carlos, also harbours a secret love story from his past, from before the Green March in which Morocco claimed dominion over the western section of the Sahara desert: the love of his life, Maima, disappeared when the Moroccan armies occupied the Spanish Sahara in the November of 1975. This was a time when Dajla was known by another name; “Villa Cisneros”. When Laia disappears, dragged back to Africa by ghosts from her past, the two love stories are revived and a new chapter in both of them begins. 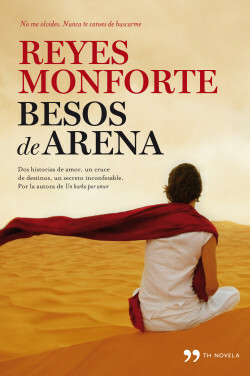 With the Sahara desert as the backdrop, Reyes Monforte provides a new perspective on still recent historical events and the ties that join Spain to the African continent. The book provides a colourful depiction of Saharaui traditions, from their superstitions to their nuptial rites, with the hartani practice at its centre: a kind of modern slavery to which thousands of young Mauritanian women are still subjected. Laia and Julio; Carlos and Maima. Entangled in a thrilling plot, the four protagonists will be forced to confront a world of sand and memories. A moving story of love put to the test in the dunes of the Sahara desert. A exotic story based on real events with colonial settings and a happy ending. A new perspective on Spanish history and Spain’s relationship with Morocco together with a colourful depiction of Saharaui traditions, as well as a denunciation of modern slavery practices. Planeta Brasil (Brazil), WAM (Poland).